Enjoy your food the Gujarati way! 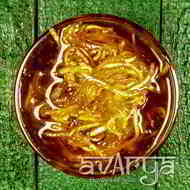 With Avarya's Chhundo Pickle, you are in for a tempting meal which includes a sweet and tangy flavour of crushed mangoes. This side dish preparation is the most inviting of all as it can go with any type of meal, whether it's a spicy one or a mild preparation. Chhundo Pickle	AC-PK-1107 Enjoy your food the Gujarati way! With Avarya's Chhundo Pickle, you are in for a tempting meal which includes a sweet and tangy flavour of crushed mangoes. This side dish preparation is the most inviting of all as it can go with any type of meal, whether it's a spicy one or a mild preparation. The shelf life of Chhundo is 180 days. Made of all-natural ingredients and a perfect blend of spices, this is an ideal choice when it comes to tasty pickles. Savour the goodness and reminisce the taste of your homemade pickle that keeps you wanting more with every bite of it.